These bee pendants have become one of my most popular handcrafted jewelry designs, I really had no idea bees were so popular. 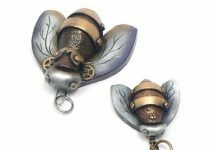 The bees are another design based on one of my early scroll sawn painted woodcraft projects…these are so much cuter though. 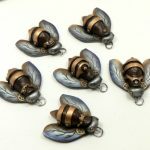 Each bee is entirely handmade by me from polymer clay, highlighted in various metallics for my faux metal style, and antiqued for that post apocalyptic aura. 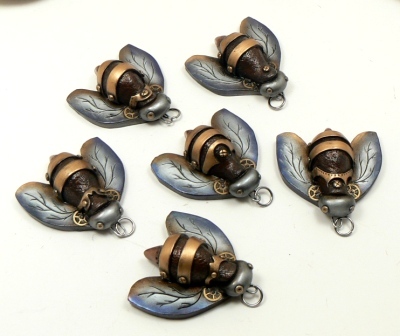 I usually put gears in my bees and they all have faux metal straps for ‘stripes.’ All my later bees, like this new batch in the photo, have an antique copper body which I love, gives them a great rustic, steampunk look that the earlier ones did not have. I think I went a bit darker on the wings for this batch and I love that, too! Nice job, I actually like the darker wings! Kudos on the new bees. 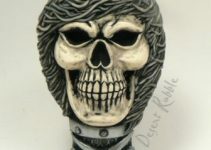 So cute in a steampunk sort of way. 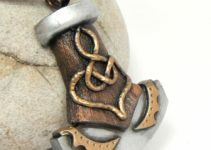 I also like the antique copper body and the slightly darker wings for this batch, too.